Here at Lespwa Academy we want you to choose where your donation goes. We have 4 major campaigns you can donate towards or feel free to make a general donation as well. All donations are welcomed and appreciated. The education first campaign is geared towards all aspects of education; from painting classrooms and building chalkboards and desks, to buying school supplies and computers. This campaign is a running campaign that will constantly support the daily operations of the school. Lespwa Academy wants all children to have an equal opportunity. We want children to know that their dreams are attainable and that their wants and needs, are our wants and needs. Every child deserves the right to a free education. This campaign is all about the children of Haiti. Your donation will go towards each and every child we serve, so that no child is left behind. Lespwa Academy is in need of a truck. This would be to transport teams to and from the airport, make quicker trips into the city and will serve as transportation to our staff and teachers each day. 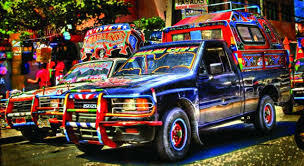 The cost of a used truck in Haiti will be roughly $25,000 USD. Transportation is a crucial element in the success of the organization. Every child deserves to feel loved and cared for. They deserve a safe home to live in. Lespwa Academy is that home to any child in need. This campaign helps fund the basic needs to keep the home running. It funds the staff for 24/7 care, food and medical supplies, beds, blankets, clothing, and so much more.